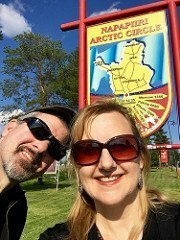 We’ve been crisscrossing the United States for the last three years and visited all 50 states to seek out the best donuts in America. Here’s our ranking of the best dozen donuts of the many, many, way too many, that we tasted, with a bonus added to make it a baker’s dozen. And just to be clear, there are no bacon donuts on this list. As old-school donut hounds, we’re patiently waiting for that trend to end. 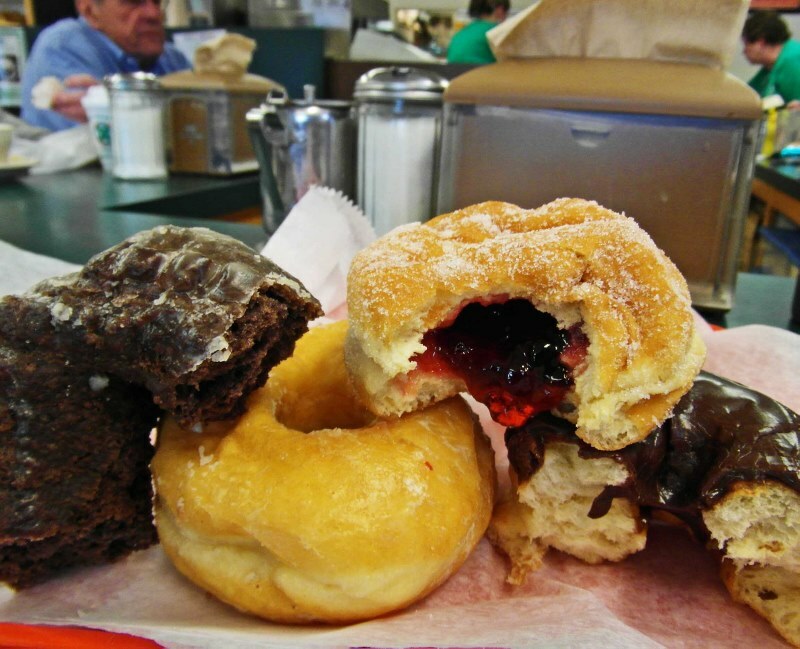 The donuts at Frangelli’s look plain until you realize those are just the shells. When you order your donut they slide it onto a nozzle attached to a Rube Goldberg type contraption and pump it full of jelly. They you have your choice of rolling it in powdered or crystal sugar. Heaven in a donut. Marie’s opens at 11 p.m. and closes at 4 p.m. so it’s perfect for night owls, and isn’t after midnight the best time to eat a donut anyway? They’ll fill any donut with whipped topping (it’s not cream but still very good). 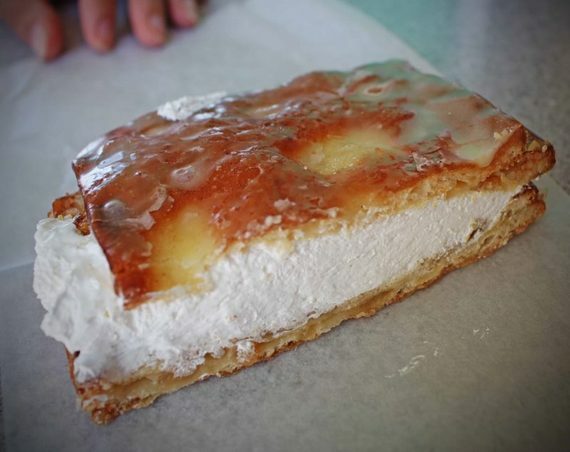 Our fave is the square donut with its flaky layers filled with creme. It tastes like apple pie a la mode. 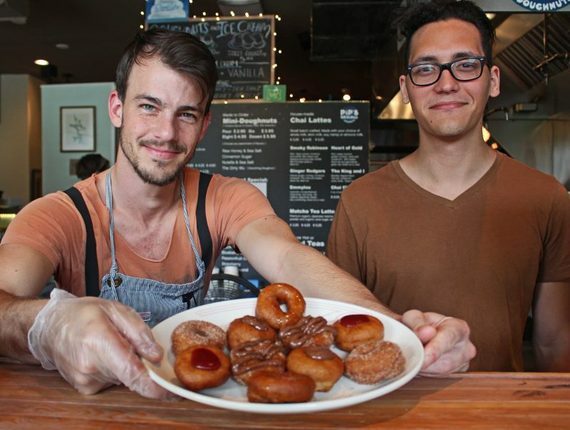 Picking the best donut in Portland is always controversial. 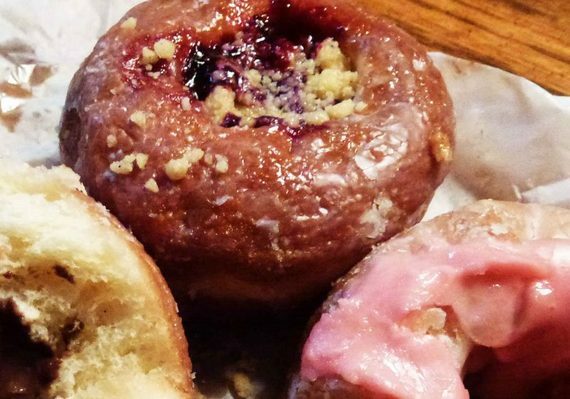 While there is a much more famous place with lines of tourists snaking down the street, we prefer Pip’s for its fried-to-order addictive donuts. The Dirty Wu is covered with cinnamon, locally-made honey, pink Himalayan sea salt and then drizzled with Nutella. They are small, so don’t worry about polishing off a dozen or so. 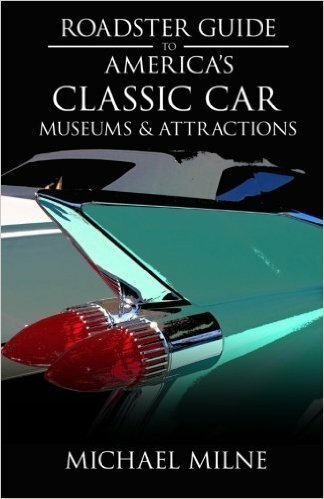 One suggestion to Pip’s, get a web site already so we can drool over these lovelies. 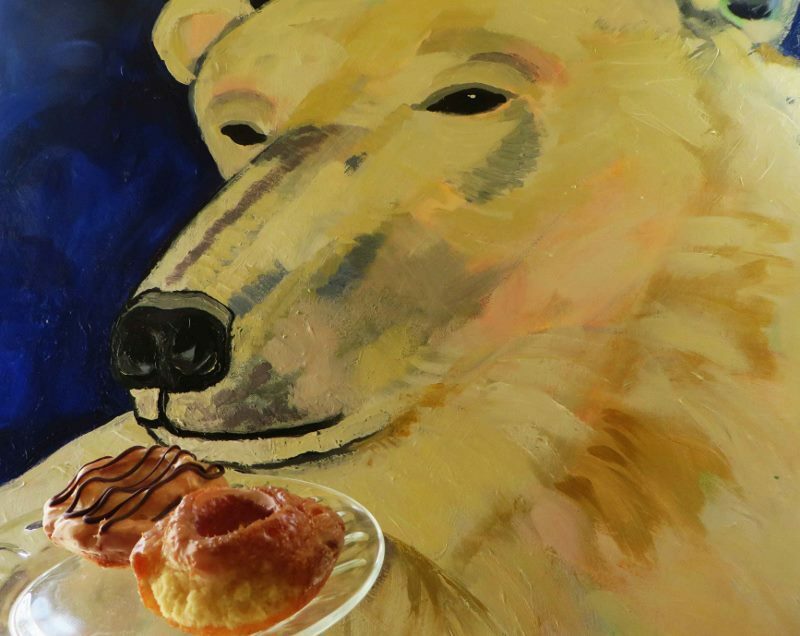 It’s easy to walk by this gift shop in downtown Alaska without noticing the small sign that states “Coffee and Donuts.” Follow your nose to the back of the shop where the crew is frying up small batches of old-fashioned donuts then lovingly glazing them. Well at least it seemed lovingly to me. Even the polar bear on the back wall couldn’t resist. In tribute to the King’s favorite sandwich, Pink Box offers a peanut butter filled donut, topped with chocolate icing and a caramelized banana chip for that southern flair. 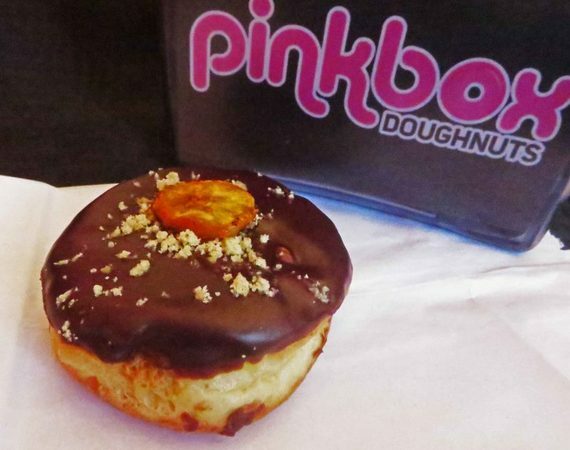 We’re finding Fat Elvis donuts taking off across America, but Las Vegas seems the perfect place to try one. 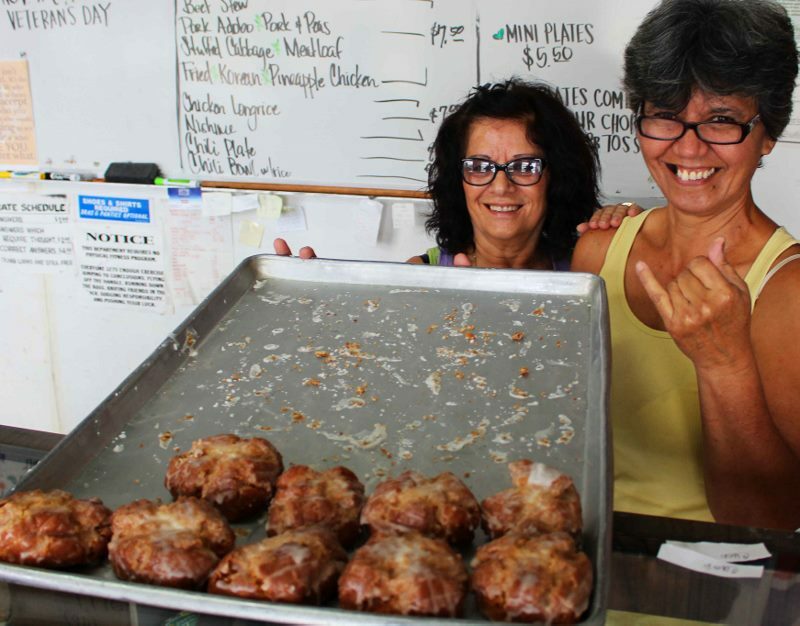 It takes a real expert to make a crispy donut in Hilo, one of the wettest cities in America. But at Rolf’s they turn our perfectly crisp buttermilk donuts with just the right amount of sweet glaze for the climate. A sign on the window refers to omiyage, a Japanese term for souvenirs from your travels. We doubt any of these would last the flight home before getting devoured. The owners of Rise crisscrossed the country visiting top donut shops before opening. Evidence of their journey is the collection of t-shirts hanging from the walls. Their in-season strawberry frosting is sublime. The dense Devil’s food donut at Bill’s is just begging to be dunked in chocolate. 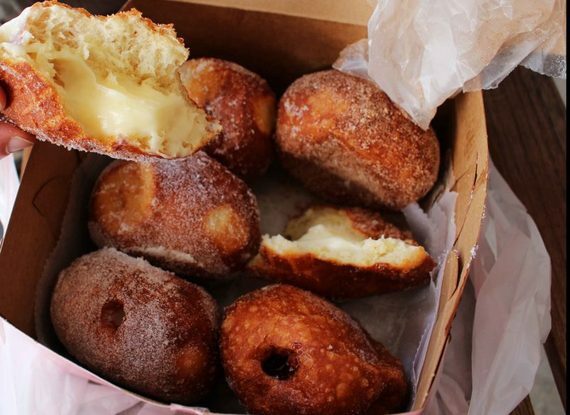 Is it a slice of cheesecake or is it a donut? 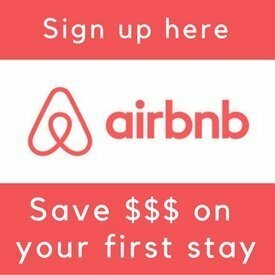 How about both at this popular spot on the way to the beach. 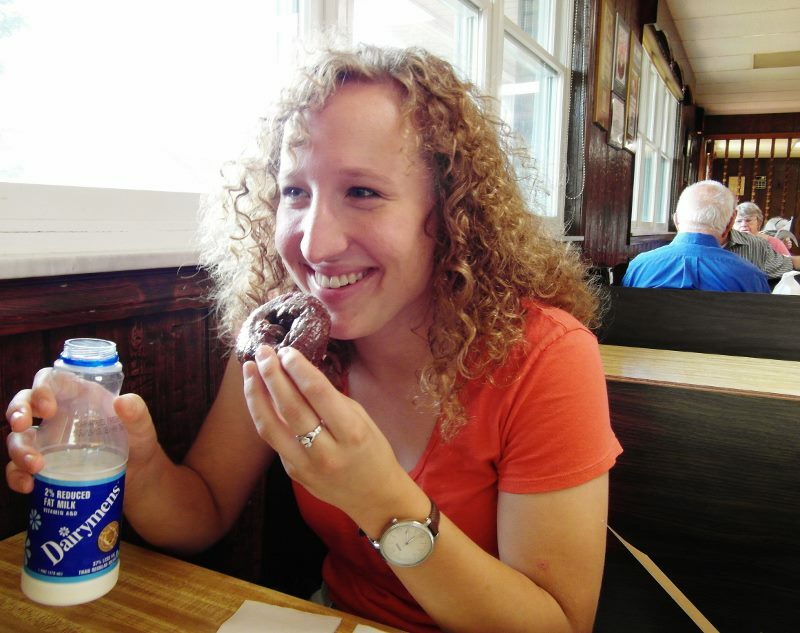 Mrs. Murphy sure knows her chocolate donuts. And since this as close as we get to Boston on this list you may as well try the excellent Boston Cream Donuts while you’re here. 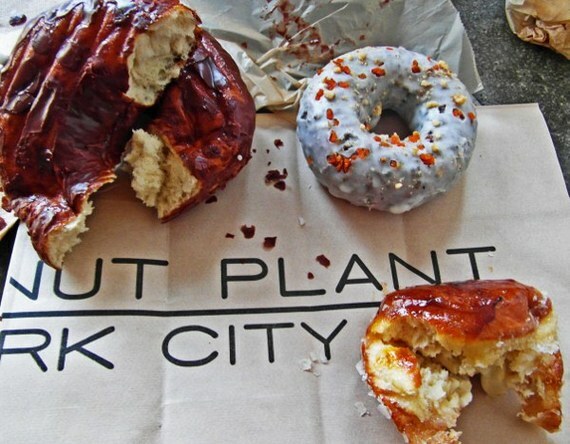 Opened in 1994, for better or worse (we’re looking at you bacon donuts) the Doughnut Plant was behind America’s donut renaissance of the last two decades. However, they upped the quality level of the humble donut while staying true to their core mission. 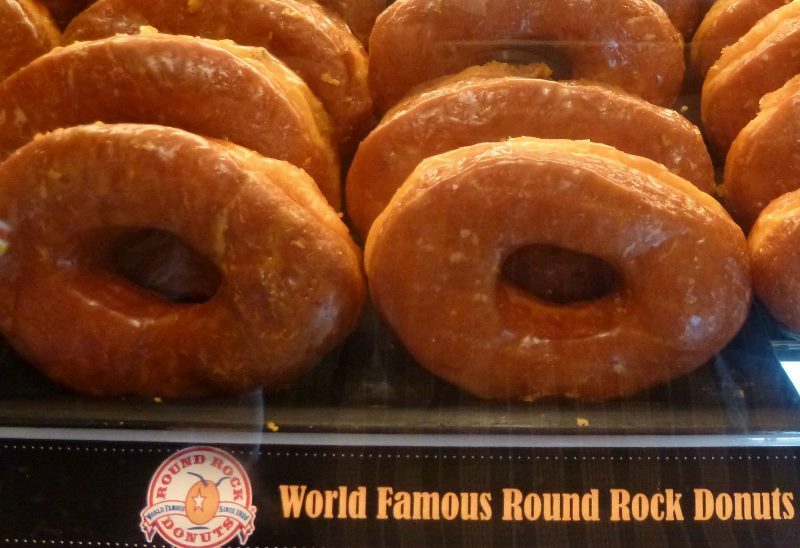 Being an avowed cake donut person, Michael was skeptical at first of all the acclaim earned by Round Rock. But one bite of their famous glazed “Round Rock” donut made him a believer. If you want a yeasty glazed donut with some bite to it, this is the one to judge them by. 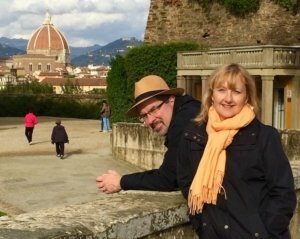 For such a small state Hawaii manages to take up two places on this list. Malasadas are fried balls of dough that originate from Portugal, just like the owners of this bakery. 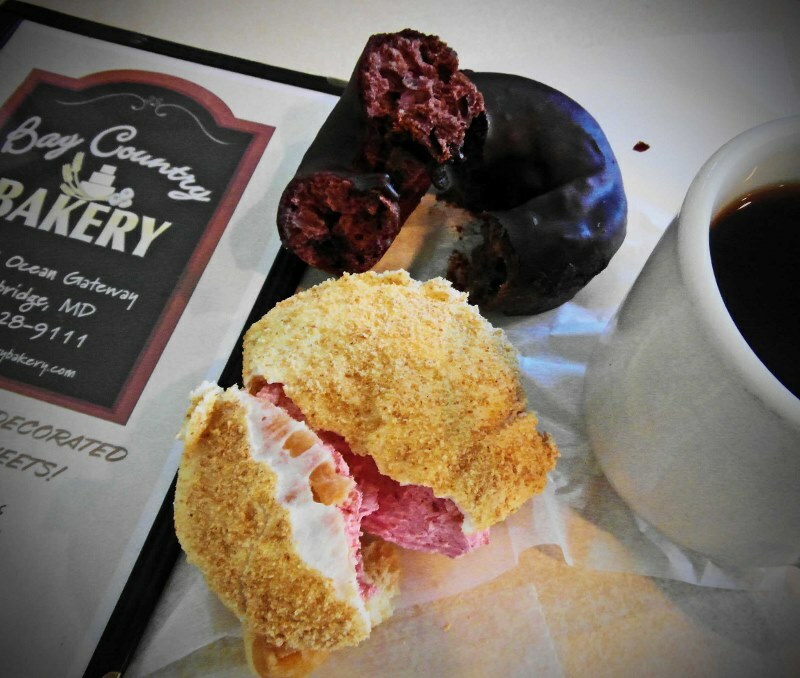 At Leonard’s they are filled with your choice of custard, chocolate or coconut cream then coated with sugar, cinnamon sugar or li hing, a sweet and sour dried plum powder. You’ll wait about 10 minutes for your donuts since they are made to order. The wait is most definitely worth it. 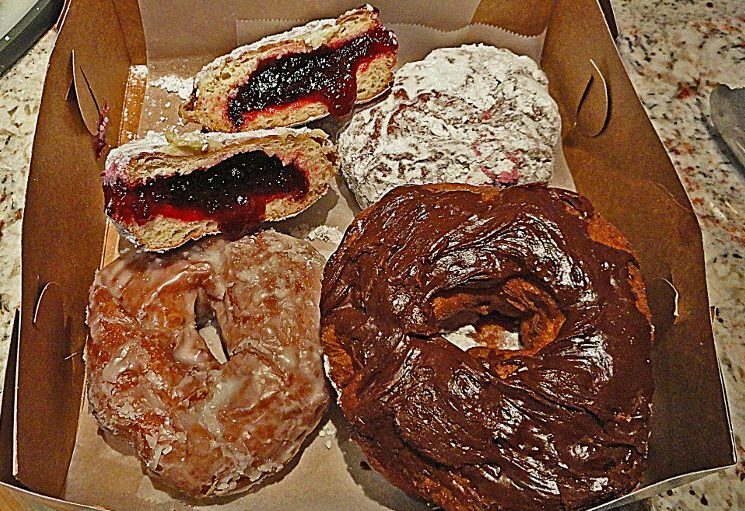 Let’s face it, we can’t write about donuts without creating some controversy. So which ones do you agree with and what favorites did we leave out in your area?